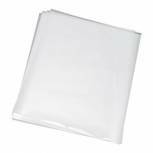 Q-Connect A4 Laminating Pouch 160 Micron (Pack of 100) KF04114 Pack of 1 Laminating pouches for professional looking documents. Ideal for posters, photos, signage and more. 80 micron each side (160 micron in total). Create waterproof and tear proof documents. Professional looking results. A4 size. 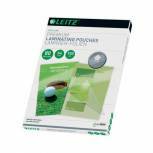 Pack of 100 pouches. 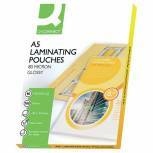 Q-Connect A3 Laminating Pouch 160 Micron (Pack of 100) KF04122 Pack of 1 Q-Connect Laminating Pouches. Size: A3 303x426mm. 80 micron each side. Pack 100. (A4 size illustrated). 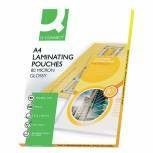 Q-Connect A4 Laminating Pouch 250 Micron (Pack of 100) KF04116 Pack of 1 Laminating pouches for professional looking documents. Ideal for posters, photos, signage and more. 125 micron each side (250 micron in total). Create waterproof and tear proof documents. Professional looking results. A4 size. Pack of 100 pouches. 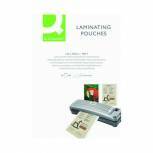 A4 Lightweight Laminating Pouch 80 Micron (Pack of 100) WX04114 Pack of 1 Pouches for laminating documents. Provides sturdy, spill-proof enclosure. Glossy texture for bright colours. Lightweight material for flexibility. Format: A4 (210 x 297 mm). Pack of 100 pouches. 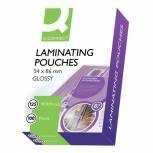 Q-Connect 54x86mm Laminating Pouches 250 Micron (Pack of 100) KF01203 Pack of 1 Laminating pouches for professional looking documents. Ideal for name badges, business cards and more. 125 micron each side. Create waterproof and tear proof documents. Professional looking results. Size: 54x86mm. Pack of 100 pouches. 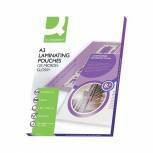 Q-Connect A5 Laminating Pouch 160 Micron (Pack of 100) KF04106 Pack of 1 Q-Connect Laminating Pouches. Size: A5 153x216mm. 80 micron each side. Pack 100. (A4 size illustrated). 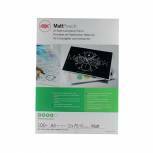 Q-Connect Matt A4 Laminating Pouch 160 Micron (Pack of 100) KF24057 Pack of 1 Q-Connect Matt (non-reflective) Laminating Pouches. Size: A4 216x303mm. 80 micron each side. Pack 100. 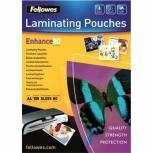 Fellowes A4 Laminating Pouch 160 Micron (Pack of 100) 55306101 Pack of 1 Suitable for notices and photos. Size: A4. 80 micron per side, giving a total micron thickness of 160 micron. 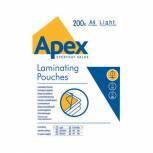 Fellowes Apex A4 Laminating Pouch Light Duty 150 Micron (Pack of 200) 6005301 Pack of 1 Affordable laminating pouches for use with laminating machines. 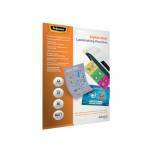 Protects documents under a clear layer of plastic. 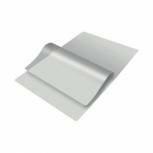 Designed for light duty laminating. 80 micron. A4. 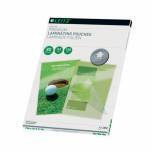 GBC Laminating Pouches Premium Quality Matt Non Reflective 150 Micron For A4 (Pack of 100) 3747240 Pack of 1 Laminating pouches with non reflective matt finish, silky touch and write on surface. Ideal for frequently used documents. 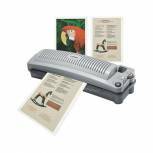 Usable with all standard A4 laminators that have a lamination width of at least 230mm. Size A4. 2 x 75 micron. Q-Connect A4 Laminating Pouch 200 Micron (Pack of 100) KF04115 Pack of 1 Laminating pouches for professional looking documents. Ideal for posters, photos, signage and more. 100 micron each side (200 micron in total). Create waterproof and tear proof documents. Professional looking results. A4 size. Pack of 100 pouches. 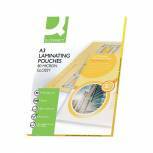 Q-Connect A3 Laminating Pouch 250 Micron (Pack of 100) KF04124 Pack of 1 Q-Connect Laminating Pouches. Size: A3 303x426mm. 125 micron each side. Pack 100. (A4 size illustrated). 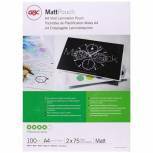 Q-Connect Matt A4 Laminating Pouch 250 Micron (Pack of 100) KF24055 Pack of 1 Q-Connect Matt (non-reflective) Laminating Pouches. Size: A4 216x303mm. 125 micron each side. Pack 100. 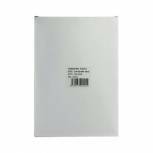 GBC A3 Matt Laminating Pouch 150 Micron (Pack of 100) 41660E Pack of 1 GBC 41660E A3 matt pouches protect heavily handled daily reference documents with a tough matt laminate that adheres to both sizes of printed matter. 150 micron. GBC Document Laminating Pouches A4 150 Micron Gloss (Pack of 100) 3740400 Pack of 1 GBC Laminator Pouch - 3740400. Pre-trimmed 150 micron pouches, resistant to grease and stains. Will not tear and need no trimming. Size: A4.